Jaushua Sotirio and Tarek Elrich both scored in Western Sydney's 2-0 win over Central Coast in the A-League. Central Coast are in danger of finishing with back-to-back wooden spoons after losing 2-0 to Western Sydney in a scrappy battle of the A-League cellar-dwellars. A lucky goal from Tarek Elrich gave the Wanderers a halftime lead on Saturday before Jaushua Sotirio's classy finish sealed the win late in the second. The home victory ends a club-record 10-game winless run but, significantly, lifts them seven points clear of the last-placed Mariners with nine games remaining. For Central Coast, the uninspiring display extends their own club-record streak of away losses to a ninth match. But, perhaps more despairingly, they are now a real chance of becoming just the second club in league history to finish last in consecutive seasons. Mariners coach Mike Mulvey admitted the bubble had burst on his team after a string of strong performances without results. "Maybe the toll with regards to what the effort that we put in over the last seven or eight weeks," Mulvey said. "Maybe the heat, maybe Matt Simon missing (back injury), that leadership. But we don't have excuses. We just need to turn up and we didn't turn up today." Mulvey made two changes to the Mariners side that blew away a two-goal lead to Melbourne Victory last week, including major signing Jem Karacan. Goalkeeper Ben Kennedy denied Oriol Riera in the 24th minute with a diving save and the visitors posed little threat to the Wanderers' goal at the other end. In fact, most of the first half was a dire affair symbolic of both teams' lowly positions on the competition ladder. That was until a Riera header from point blank range that clattered into the post in the 45th minute, which was quickly followed by Elrich's speculator. The Wanderers' veteran was in space down the left channel and fired towards the back post, only for it to bounce into the woodwork and into the roof of the net. It was the 32-year-old's first goal in Wanderers colours and first in two years. Other than a 56th minute Matt Millar volley tipped over by Vedran Janjetovic, the home side enjoyed most of the possession and territory in the second period. And their suffering 7,064 fans were rewarded when Roly Bonevacia put Sotirio into space on the counter, and the attacker finished coolly to Kennedy's left. 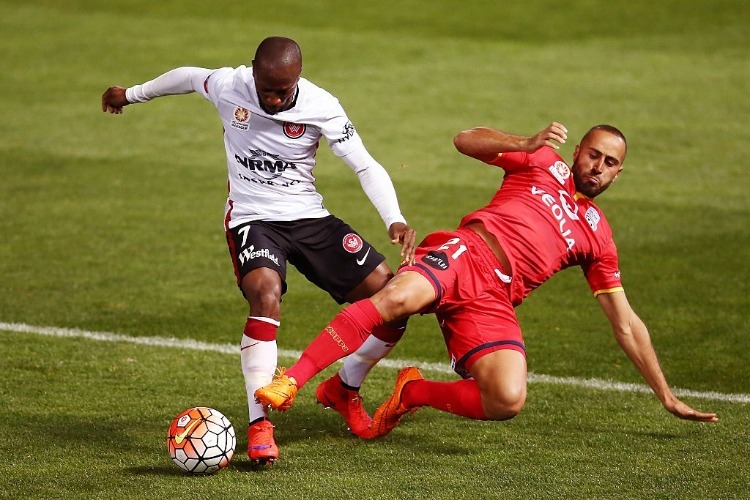 The only negative for Wanderers coach Markus Babbel was a suspected groin injury to Kwame Yeboah that forced him from the field early in the first half. The German was proud of his team for squeezing out a win despite being low on confidence. "You could see it in the week. Many talks with the team and you will see the confidence is not there. Their heads were down," Babbel said. "I'm very proud. I'm not saying this because we won, but because it was a very difficult game and they did many things right, especially defensive-wise."